All PYAC events are open to all. There is no requirement to be an official UA Alumni Association member nor do you have to be a “young” alum. 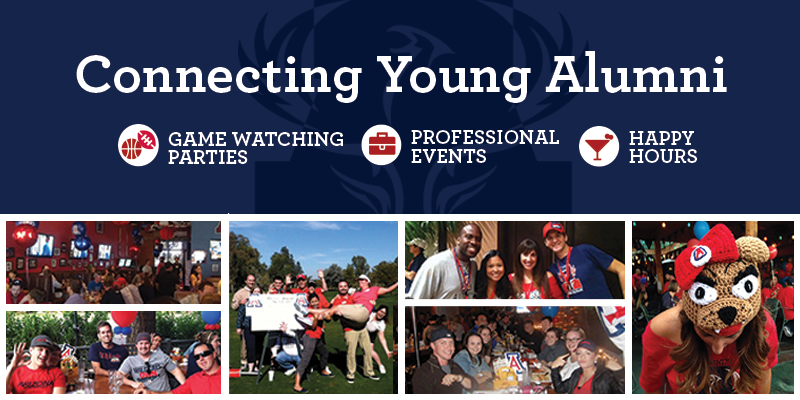 If you share a passion for the University of Arizona, we'd love to meet you. Check out our master calendar of events at facebook.com/uaaapyac/events. The all-volunteer board of directors is the group of UA alumni entrusted to guide PYAC. We gladly accept volunteers to help setup for events, greet guests, sell raffle tickets at game viewings and more. Just send your contact information to UofAYoungAlumni@gmail.com and we'll add you to our volunteer database and let you know of upcoming volunteer opportunities in which you will be paired with a PYAC board member. We are always looking for enthusiastic and passionate UA alumni to join our board of directors. Involvement on the board is a great way to continue to share your UA passion post-graduation and meeting other young alumni in the Phoenix area. Learn more. Joining our email list: Click here.